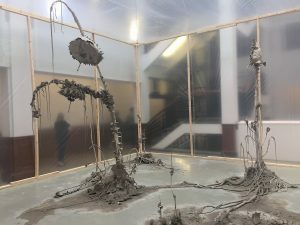 Material Environments, the current exhibition at The Tetley, is an experimental exhibition with five artists whose work addresses physical and psychological change. Material Environments, the current exhibition at The Tetley, is an experimental exhibition with five artists whose work addresses physical and psychological change. 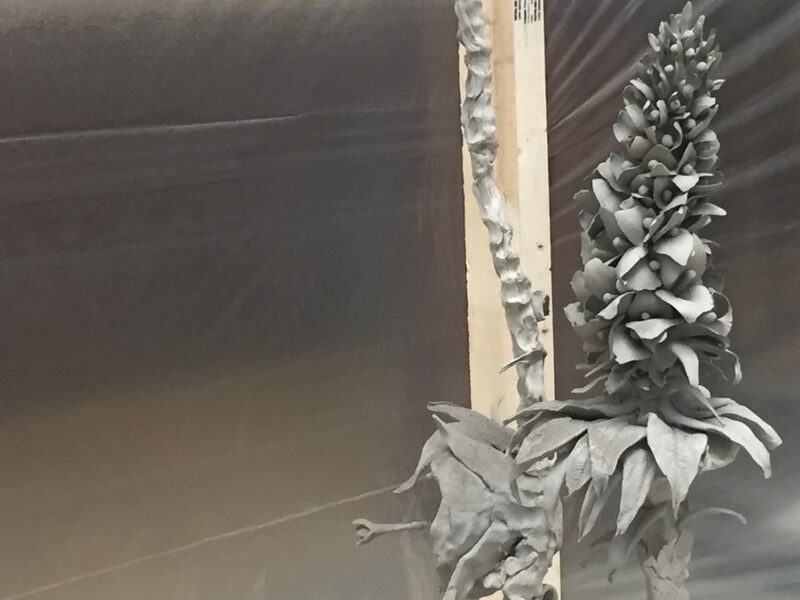 Utilising a wide range of methods and materials the artworks address subjects such as botany, chemical science, architecture, music and social media with a healthy sprinkling of pop culture references. As I head up the staircase into the exhibition space the sound of Nirvana playing in the cafe / restaurant space recedes into the background, along with the smell of food emanating from the kitchens. The change in environment here is a slow and subtle one. Instead of what can often be an unnerving shift from noisy street level into sombre white wall gallery space, here we shift from the convivial cafe atmosphere into a network of rooms with wood panelled walls that at one time served as offices. Pop culture pervades in this environment too in the form of Harold Offeh’s photographic prints of people recreating an eighties album cover by soul star Teddy Pendergrass. The selection draws attention to the frequent references to classical reclining poses struck, in particular, by Black male singers including the likes of Michael Jackson, Lionel Richie and others, in popular music. Offeh’s work also questions notions of authenticity through his collection of records all entitled ‘The Real Thing’, a strangely eighties phenomenon judging by the amount of releases, the covers of which are on display, from that decade. 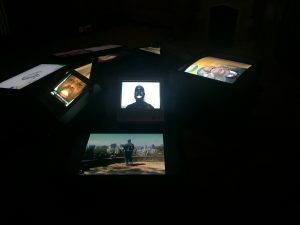 Alongside the record sleeves is a room collectively titled The Real Thing: Towards an Authentic Live Archive filled with films by the artist documenting various projects as a performer. The normally open vertical space of the atrium for this exhibition has been enclosed in the manner of a temporary hot house, timber frame covered in thick plastic sheeting, strangely reminiscent of the work in progress that was Leo Johnson’s house in the TV series Twin Peaks. Within the hot house the environment is equally disquieting containing, as it does, a number of massive rather alien looking plants made by Phoebe Cummings from unfired clay. These works are absolutely monumental in their scale yet somehow manage to look fragile and menacing in equal measures, particularly as the clay dries and cracks appear. The material will be eventually returned to the earth mirroring the cycle of birth, life and death of all organic matter. Across the corridor a room contains research material for the work including a number of sci-fi books that would be familiar to most such as John Wyndham’s ‘The Day of The Triffids’. Cummings’ alien environment is picked up in the next two rooms by Serena Korda. Here a selection from an extensive collection of UFO magazines sits alongside a surround sound audio work that incorporates live noise from the local area and mixes it into field recordings from Todmorden, an alleged UFO hotspot. Running the length of the corridor between rooms is a series of photographs by Joanna Piotrowska portraying a number of temporary shelter structures. Built by adults in their homes, but in the manner that children would build dens with whatever materials can be found, this work feels sadly relevant to the situation beyond the confines of our own homes as people are forced to do this in the unforgiving environment of the street. Elsewhere in this exhibition Keith Harrison’s production of barrels full of CO2 gas are a reference to the previous history of the building and its production of beer. 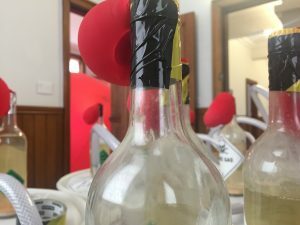 For the first couple of weeks of the exhibition the barrels were actively brewing in one room and inflating a massive red ballon that almost filled the next room. Now as the active process declines we literally witness the changing state and the once expanding balloon is starting to crumple in on itself, echoing Cummings clay flora in the atrium. This exhibition draws upon the Freudian notion of the uncanny. It is not just that these artworks are mysterious, but their power is drawn from our familiarity with much of what we are witnessing. Pop culture consumed, digested and fed back to us in a format that we find strange; materially changed yet somehow still the same.